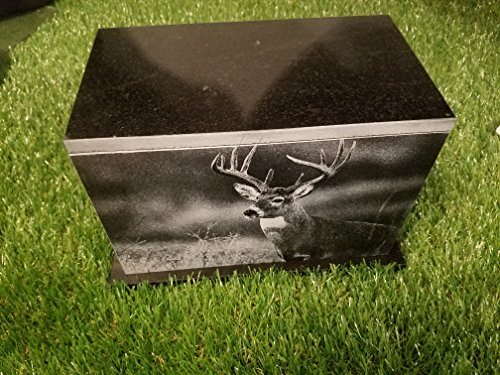 This listing features our Hunting & Bass Fishing Urn This Granite Urn is handmade in my shop, and is a CUSTOM designed original. This urn is an amazing way to celebrate the life of a loved one. This urn as shown, can be personalized on both ends and top. If you would like to order an urn without the hunting theme please contact us. We will be happy to customize the urn as requested. NO EXTRA CHARGE for engraving. We will design the urn as shown or make something new with your ideas. Please note this urn is not something setting on a shelf waiting to be personalized. This is truly a handmade work of Art, that will need time to be produced. If you are in a rush PLEASE contact us and we will try our best to work with you. Production time is about 3-4 days. Our urn will hold up to 175 Cubic Inches of cremains. (1 inch of space for each pound of body weight before cremation) Urn Size: 10"x 6' at base 6.5" tall 5"wide Urn weight: 12 lbs empty! Material: Black Granite Smaller sizes can be made. Please ask for a custom listing Urn Ideas: Flowers for Mom or Grandma, Hunting theme for Dad or Brother Beach theme, The sky is the limit! If you have any questions about this product by The Memories Collection, contact us by completing and submitting the form below. If you are looking for a specif part number, please include it with your message.